Can you even remember the last time you enjoyed a cup of coffee in a public cafe while customers were chatting happily amongst themselves without looking at electronic devices? We’re already so steeped in the information and technology age that it’s hard to imagine venturing out into public and not seeing people submerged in their smartphones, iPads and portable computers, but believe it or not, there is a place in America where tuning out of technology is the rule. When you drive through or stop by Green Bank, West Virginia, you’ll immediately notice that your cell phone reception drops, your radio won’t pick up any stations, and if you try to get ‘online,’ you’ll get nothing. 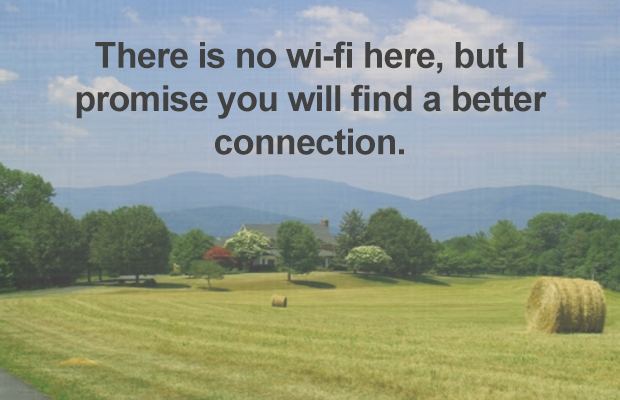 This is the one place in America where instant connectivity doesn’t exist. Boasting a population of a mere 143 citizens, Green Bank may best be known as ‘The Quietest Place in America,’ the reason for this being that it lies in the densest part of the National Radio Quiet Zone, a 13,000 square mile area where all radio signals have been officially banned, preventing anyone from logging in or dialing up. It’s not because the people of this picturesque town in the foothills of the Allegheny Mountains are shying away from advances in technology, but actually quite the opposite. You see, The National Radio Quiet Zone has been put in place to protect the very sensitive electronics signals of the world’s largest steerable radio telescope. Operated by the National Radio Astronomy Observatory, the Robert C. Byrd Green Bank Telescope is busy scanning exploding galaxies at the furthest reaches of the universe, listening for signals so faint that even a single cell phone signal can swamp the reception of this magnificent telescope, preventing scientists from hearing what is happening in our galaxy and beyond. Interference in the form electrical devices and wi-fi signals is frowned upon in Green Bank, and residents have grown accustomed to tuning out the world in order to take in the universe. Can you imagine a world without wi-fi? If you’re curious, head over to Green Bank into a world where technology rules, but cell phones and wi-fi are against the rules.